I do realize Spring is just barely beginning, but I am focusing on the crocheted items I want to make for my grandsons for Christmas . . . yes, for Christmas! I have so many projects I'm working on right now with writing, so if I am going to make something for my grandsons this year, I know I need to begin work on those projects, now! At this point I'm leaning towards making a new hat for each of my three grandsons and a sweater. I was browsing Pinterest this morning and think I've found the sweater pattern I'm going to use for making sweaters for the boys. It looks warm . . . essential component as they live here in Michigan and it definitely gets cold in Michigan in the winter! Plus, I really like the look of the sweater. I think I'll use the same main color - or different shades of brown - for each boy and then the contrast color for Josiah's sweater will definitely be orange and Caleb's will be red as they are their favorite colors. Shane has not decided yet what his favorite color is (he is just 1 1/2), but maybe by the time I make his sweater he will. Otherwise, I'll probably use blue or green. 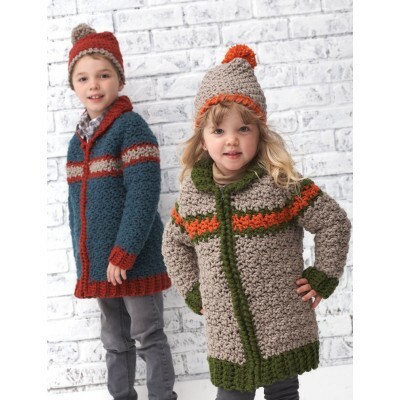 You'll find the free pattern at this link . . . what do you think? Might you make it for your grandchildren?